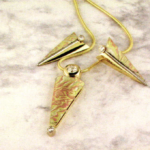 Jewelry makers need to know their metals. 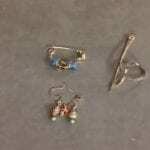 Our articles cover gold, silver, and other popular metals and techniques and tools for working with them. Of late, an increasing number of white precious metal alloys have been introduced into the jewelry marketplace in answer to industry cries for a true white counterpart to the ever popular yellow gold. The search has been on for a workable white alloy that stays white, is hypoallergenic and priced more agreeably than the often prohibitive platinum. Alloys emerging include mixtures of 50/50 platinum and palladium, 585 platinum with cobalt and copper and several alloy combinations in between. Surveys indicate consumers appreciate the purity of 900 to 950 platinum, and would prefer the purity of a 950 palladium alloy if considering an alternative. It took about two months of experimentation to get the formulas for Platinum Sterling Silver just right – Robinson created alloys containing 5 percent, 3.5 percent, and 1 percent platinum. But he’s the first to admit that combining silver and platinum isn’t a novel concept..
Did you ever imagine you’d see the day when a finely woven mesh bracelet with thousands of tiny links could be grown in one piece, on a machine, using 18k gold powder? Well, that day has come. It’s jaw — dropping, really. 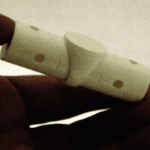 Today, thanks to additive manufacturing, an intricate piece of jewelry something that used to take countless days of hand labor to make can now be produced overnight on a laser melting machine. 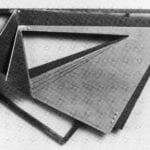 The machine builds up a net shape, layer by layer, much the same way as a rapid prototyping system does only instead of resin materials, the layers are made of metal powder. Putting a spin on tradition, Alexandra Hart of Alexandra Hart in San Diego crafted Broollopskronan, or Bridal Crown, a regal wedding headdress. The commission from a half-Swedish bride for something unusual but still traditional had Hart exploring her own Swedish roots. She and the client considered many options through sketches before deciding to go with this modern interpretation of a practice that dates back to the Middle Ages, when Swedish brides wore crowns loaned to them by their churches on their wedding days. 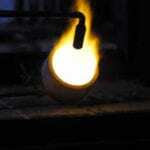 Alloying your own gold and silver is explained in detail. An alloy is by definition a mixture of two or more metals to create different strengths and colors. For granulation, the following formula is preferred. 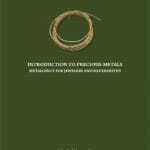 It is important to start with pure metals. 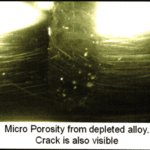 Even trace amounts of impurities can result in flaws in the metal. In the jewelry industry, it’s rare to have an alloy without drawbacks, particularly when the alloy is not yellow. 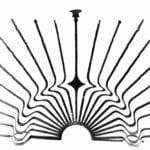 When designing alloys, there are a number of hurdles to jump. First, color is absolutely critical. Unfortunately, we alloy designers have a relatively limited palette to work with. Gold and copper are the only two metals that are truly “colored;” all others are varying shades of gray. 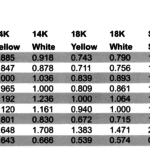 So when we design a white alloy, we dont make it “whiter,” we make it “less yellow.” . 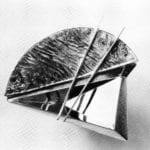 The purpose of this paper is to acquaint the reader with the advantages and disadvantages of utilizing aluminum as a material for construction of wearable ornaments. In high-purity form aluminum is soft and ductile. 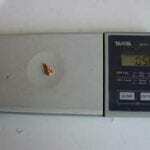 Most commercial uses, however, require greater strength than pure aluminum affords. 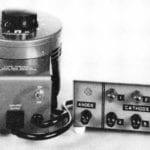 This is achieved in aluminum first by the addition of other elements to produce various alloys which singly or in combination impart strength to the metal. 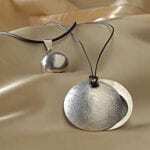 Invented in 1996 by Peter Johns, a professor of silversmithing at Englands Middlesex University, Argentium[R] Sterling Silver, like traditional sterling silver, is at least 92.5 percent pure silver. But unlike traditional sterling, which is 7.5 percent copper, Argentium sterling has a small amount of germanium instead of some of the copper. So how does that change things?. 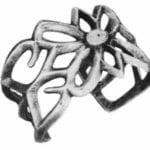 Standard sterling silver is not a perfect material to work with firescale adds extra production costs and the tarnishing characteristic discourages potential customers. Firescale-free, highly tarnish-resistant Argentium Sterling Silver eliminates these problems, and the ability of the alloy to be welded opens up new production opportunities. This book is not only very good, it is important. 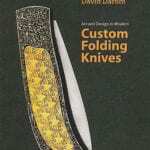 In the introduction, author David Darom, who is a marine biologist, photographer and collector of knives, describes becoming aware of a gap between the exquisite work he saw in shows and a general perception of folding knives primarily as practical tools. 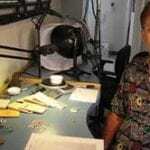 As a successful author of 20 books on a wide range of subjects, Darom took what was for him a logical route to close this gap; he made a showcase book to exhibit what he calls a Hall of Fame of leading knifemakers..
About 15 years ago a friend showed me a copy of the first edition of Mark Grimwade’s Introduction to Precious Metals, and I immediately knew I wanted my own copy. Since the book was already out of print and I could not find one, I begged my friend to allow me to photocopy his. A few years later, I met Grimwade for the first time at the Santa Fe Symposium, and one of the first questions I asked him was when he was going to have his book reprinted. 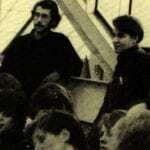 Over the next 10 years, I continued to ask him about it every time I saw him. Though I am sure that I was not the only person to hound him about this, I believe we all owe a debt to his wife, Pamela. In the preface to the book, Grimwade dedicates it to her: “It was she who sat me down one evening and told me in no uncertain terms that I had to get on with it.” Thanks in part to Pamela, the book is finally again available in a greatly expanded version. Core Understanding. In many countries, regulations govern the caratage of gold solders used to make jewellery and, with few exceptions, gold solder alloys should be of the same caratage as the jewellery. One problem with the production of solders is to ensure a good colour match with the jewellery being assembled. 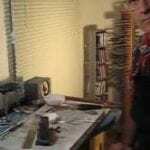 Video showing how the casting process is made. 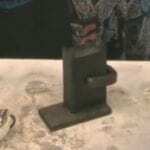 The principle of bi-metal casting is really very simple: A wax model is invested, cast and finished. A secondary wax is created, which is going to become part of this piece. 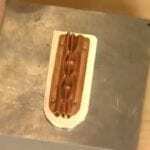 The wax is attached to the first casting, re-invested and the metal is cast on, thus creating a piece that is made with two metals. 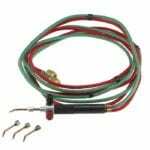 It is recommended that mechanical fastening devices, such as plugs, tracks etc. be worked into the design. The piece is then finished as usual. 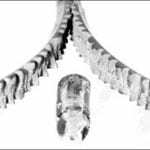 Much of the recent literature on defects that occur in jewellery manufacture is focused on those occurring in lost wax investment casting. 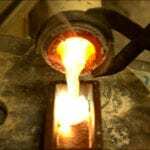 However, defects can also occur during casting of ingot and its fabrication into sheet, tube, wire and rod as well as their onward fabrication into jewellery components by processes such as stamping and forging. These defects, along with their causes and prevention, are briefly reviewed in this article, although those defects occurring in the die-striking of findings are described elsewhere in this issue. In recent years, we have witnessed a growing concern of manufacturers and retailers regarding the quality of the jewelry products. Closer attention is being paid to such issues as general aesthetic appearance, surface finish, color consistency, strength and overall durability of jewelry. 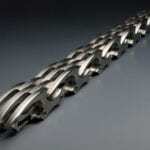 Responding to the increasing quality requirements, we have made an attempt to develop some specific methods for testing the finished jewelry products including various chains, bangle bracelets, castings and components..
As you may have noticed (Id be astonished if you hadnt), prices for gold and silver, platinum too, are on the rise. First, a word of advice: Dont panic, it doesnt mean we are going to have to price ourselves out of our markets. Now if only we can convince the customers, who are also privey to the knowledge of rising gold and silver prices, that jewelry is still a good buy. The popularity of white gold has us all looking to the most perplexing gold we use. Perplexing a variety of ways. 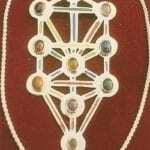 Why would we want to ‘colorize’ gold at all? Design creativity of course, but the color purists (you know who you are) have their say too. After all there are two other precious metals that are white. I happen to like white gold on its own or for contrast. We can not just use platinum instead. 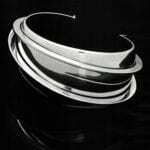 A larger item can be unwieldy in platinum, and silver is a different look and market anyway. Who has not dreamt of that nobly shaped chalice, enameled all over with immaculate transparents… maybe just one fine gold line winding around its outside… so elegantly understated, so utterly simple… That is poetry. It would neither work nor last. 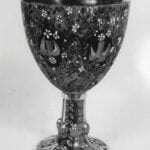 A chalice has to withstand very hard use, and maybe even abuse. It must be carefully planned. That is why I have made this cup a teaching example. [Step by step with illustrations]. While researching ancient design I have been fascinated with basic shapes from the Paleolithic, Neolithic, ancient Celts, pictographs and petroglyphs. Did you know that zigzag or wave pattern was the earliest symbolic motif recorded? Neanderthals used this symbol around 40,000 B.C. or earlier. 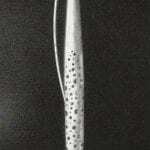 This pattern was used with and on anthropomorphic, bird, fish, and phallic images and objects. The symbol was used on Near East Neolithic ceramics and in reference with the M sign mu, meaning water, in Egyptian hieroglyph and the ancient Greek letter. 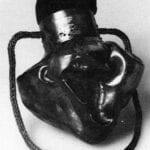 The coil is another early motif incorporated by early man in artistic expression.. 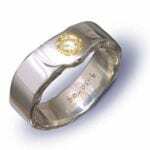 Cold forging in the karat gold jewelry industry has sometimes been referred to as stamping, coining and die striking. 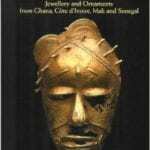 This process has been used throughout history in the making of coins and medals as well as jewelry. 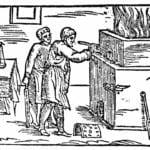 Cold forging basics will always be the same as they were during antiquity; however, the fine points are constantly being refined. 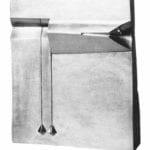 The process is simply described as forming a finding by using extreme force to drive raw material into a shaped cavity in a steel block. While it may sound simple, there are many subtle conditions that will effect the outcome. In modern melting and casting technology, the need for products able to front competition in the field of quality and price encourages the development of new alloys that can guarantee better performance. 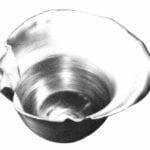 Most significant innovations have taken place in alloys for investment casting, to improve the quality of castings. Additions of many elements to gold alloys have been experimented, but only a few of them appear to be sufficiently effective and easy to use. In this paper, we describe work carried out to examine technical and practical performances of some yellow 18 carat gold with additions aiming chiefly at improving alloy castability. Alloys of different composition have been tested and the effects of the different alloying additions have been compared, in order to find the addition elements that show better performance and able to give a true improvement of the quality level of the castings. Jewelers are a restless and inquisitive group. 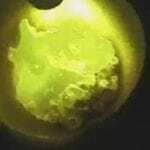 Not content with producing sumptuous jewelry, they spray it with chemicals, dip it in acids or torch it. Just to see what happens. On a good day, what happens is colored metal. However, the unpredictability, potential toxicity, and the subdued color range of these patinas has driven a group of outsider jewelers to experiment with new ways to put color in its place: on sterling, copper, aluminum, and steel. 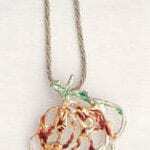 Instead of reaching for chemicals, acid, or heat, these colorists improvise with low-tech materials and experiment with new techniques that welcome spontaneity back into jewelry making. 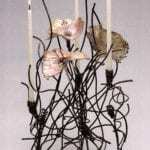 Adding or changing the color on your sculpture Titanium can breathe new life or change the character of a piece. It is also lots of fun to see the color develop and change in front of your very eyes! The color on the surface of our titanium has a permanent oxide layer that can only be removed with abrasives. The color was originally produced with heat. It starts out silver, then gold, blue, purple, magenta, bronze, green, pink and finally gray. Subtle colors also appear and depending on the natural surface finish you may get different effects. I am always surprised when I find a new shade of blue or pink or a satin luster when I expected a metallic luster. Behold the metals supplier, lord of all things shiny. He fills your crucible with casting grain and makes sure youre always one sheet ahead of the game. But perhaps more important than his ability to make metal magically appear at your door in 24 hours is his expert advice when your solder wont flow, your castings are porous, or youre just about ready to turn off your torch-for good. We spoke with a number of metals suppliers to find out what their customers commonly want to know. From metalworking problems that constantly reappear to recent concerns about new alloys hitting the market, they shared with us some jewels of wisdom. One fine day at Fine Gold in Ontario, CA, Daniel Ballard (PMWest) and Jurgen Maerz (Dir technical education- Platinum Guild) were doing some test castings at Fine Gold. They were both doing “high speed” three hour wax to cast work…. In thinking about the daily tasks that I undertake at the bench, I realized how easy it is to fall back on old habits, and to make assumptions and generalizations, particularly about the accuracy of things that I was taught early on in my career. The following are a few myths about one of the most basic procedures at the bench: sawing. From ancient times, gold has been used mostly in decorative items, and the colour of gold plays an important role in this application field. 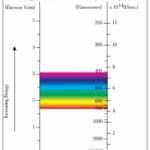 Different methods have been developed to objectively characterize the colour. This paper describes the CIELAB system, which has gained acceptance as an effective way to assess colour. The different coloured gold alloys known today are also described, with emphasis on the relationship between their metallurgy and their colour. 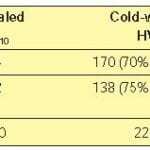 Shawna Kulpa takes a look into the assaying methods refiners use to determine the value of a lot. This article is a discussion on refiner methods from the journey a piece of metal goes through to how much they are worth…. 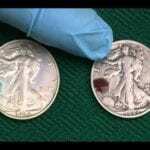 Don’t buy fake silver – easy acid test!!! Quick and easy Silver test – WARNING: if you are under 18 or unfamiliar at all with these testing methods, seek the help of a Professional -do not try this yourself. 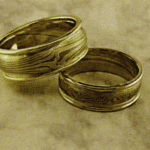 In this article in the series we will go to billet forging and making a simple wedding band in a star pattern. See previous article (link below) for a short history of Mokume gane, prep work and trimming of billet forging…. 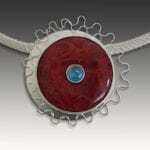 Enameling on pieces made from Precious Metal Clay is a joy! 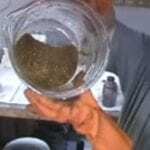 The clay is malleable and will take any shape or texture: it handles like ordinary clay before it is sintered. 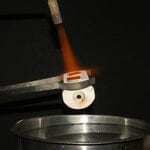 After the sintering, the material is usable in a variety of enameling techniques. 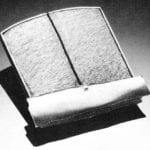 Sintering, an evaporation process, is done by firing the formed clay in a kiln at a high temperature that removes the binder and water and compresses the minute metal particles into solid metal. 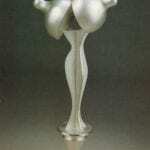 After sintering, the object is pure silver or gold and is enameled as such. 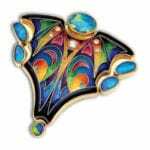 I enamel on various metals making a variety of pieces from post earrings to 5″ x 8″ framed enamels. The enameling techniques I use for sterling silver are cloisonnE, champlevE and plique-a-jour. 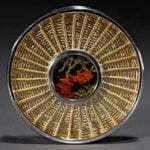 When I began enameling in 1971, it was accepted that true transparent enamels could not be used on sterling silver. 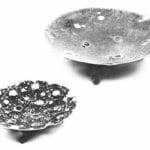 After studying with Joanna Stone, I persevered with my experimentation until I developed a procedure for enameling on sterling silver. Every step is important. My sterling enamel jewelry pieces are made with a narrow sterling frame that I cut out with a jeweler’s saw blade. The same pattern is used to cut out both the bottom piece and the frame. 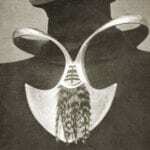 The frame is sweat soldered to the face of the sterling piece that is to be enameled. This method eliminates the need for making a bezel setting for the enamel. I also use this method for combining champlev with the cloisonn. Instead of making just a frame, I saw out two full size pieces and then saw out cells in which I will enamel and place cloisonn wires in either some or all of the cells. Today’s record metals prices have probably encouraged you to be more diligent than ever about capturing every last bit of precious metal dust in your shop. With gold in the $1,600 to $1,700 range at presstime, never before have your old polishing buffs, dust collection filters, and carpets been worth so much. When the stakes are this high, you need to work even harder to ensure that you are maximizing your return. Getting what you deserve out of your refining lot requires more than blind faith. In this excerpt from “Many Happy Returns,” which appeared in the October 2011 issue of MJSA Journal, you’ll find two steps you can take to have the most lucrative and satisfying refining experience. 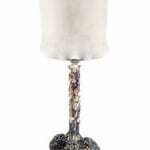 Firescale has been the scourge of sterling silver casters since the first silver was poured into a mold. 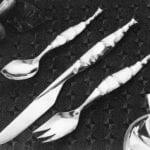 It has been a thorn in the side of silver fabricators. Fortunately there are ways to prevent fire scale while silver soldering. 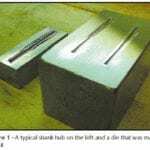 This paper describes a simple, inexpensive method of preventing fire scale during vacuum casting. 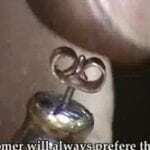 www.jewelryarts.com How to alloy 22k gold. Gold and silver have long been esteemed as the king and queen of metals, for good reason. 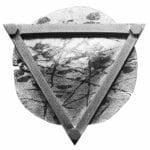 No other members of the mineral family surpass these two metals in nobility. Tarnishing is superficial corrosion of the carat gold surface and is evident by a usually dark discolouration – the tarnish film. Pure gold, of course, is not susceptible to tarnishing and this property is generally not greatly reduced by alloying to carat golds as long as the gold content is high enough. The jewellery market is looking for harder high-carat gold alloys that are more resistant to wear and scratching. Current research is addressing this need, and this paper discusses the development of a hard 22 carat gold alloy for jewellery applications. 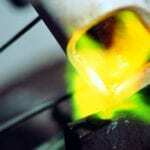 Heat treatment changes the microstructure of a metal or alloy. 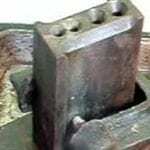 It is a process that may be applied after casting, or during or after fabrication. Since mechanical properties, such as strength, ductility, hardness, and toughness, and chemical properties, such as corrosion resistance, are in part dependent on microstructure, heat treatment can have a profound effect on them. 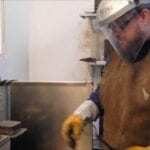 There are a variety of reasons for heat treating gold, including, but not necessarily limited to, the following: To ease polishing, reduce wear and damage on the finished surface, increase strength, and increase corrosion resistance. 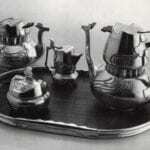 Heat treatment can also be used to increase ductility after work hardening or to impart a springy quality to components such as money clips, catches, and clasps..
Pewter, an alloy of tin, antimony, and copper, dominated European tableware for half a millennium until it was eclipsed by porcelain in the early 19th century. 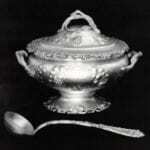 Now, almost two hundred years later pewter has entered a renaissance in the hands of creative metalsmiths. In this project, suitable for beginners, you will learn how to cut, form, fuse, solder, and finish pewter to produce a lovely and function cup. 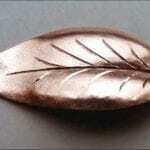 A short while back I prepared this short photo tutorial showing how I make leaves from metal. I have use this method whenever shaping leaves that adorn my creations. The tools are minimal and the process is straight forward. The leaf shown was made from copper and I photographed the process in stages to show the simplicity of manufacture, which was less than an hour. 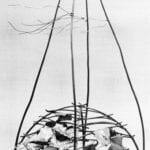 I thought this may be of interest to someone who may be interested in making leaves. Before photography, lockets were decorated with miniature, handpainted portraits — a luxury few could afford. The advent of affordable photographic miniatures propelled the locket to the forefront of jewelry fashion during the sentimental Victorian era. Between 1890 and 1920, ornately crafted lockets were suspended from bracelets, necklaces, brooches, belts, and chatelaines. Ladies of fashion were not seen without one, and men wore them on their watch chains. 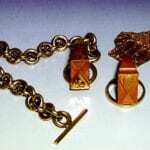 During World War I, many soldiers wore lockets into battle as a reminder of loved ones at home. 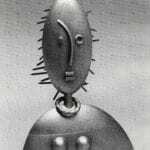 Lockets have since fallen out of fashion, and distinctive lockets are hard to find. With this project, you no longer have to rely on a fashion trend to have a high-quality locket — you can create your own. 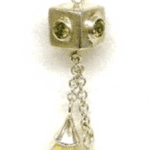 You will learn how to make the traditional hinged locket and an easier slide locket. The small-medium scale refiner (typically up to 3-4 kg per batch) tends to adopt the Aqua Regia process as being a relatively straightforward technique, capable of producing gold with a purity in excess of 99.9%. 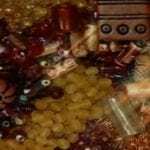 The essential steps in the process are to dissolve the refinable material (such as jewellery process scrap) in aqua regia, a mixture of strong nitric and hydrochloric acids, and to selectively precipitate the gold from the resulting solution. Japanese artists have contributed significantly by using their unique alloys in innovative combinations. Perhaps the best example of this is mokume-gane, a lamination process in which layers of various alloys are manipulated to create a rich pattern. In addition, Japanese work of many periods shows highly skilled inlay techniques where, again, the complex pallette of Japanese alloys is used to achieve subtlety and a controlled use of color. Textile techniques are traditionally worked with fibers such as linen, cotton and silk. However, they can also be applied to metal. 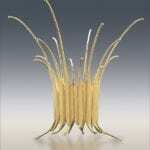 I weave high karat gold and platinum sheet and wire by hand. 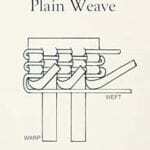 The process of weaving creates fabric. 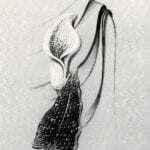 I shape that fabric into ribbons and ruffles, spirals and loops, which become earrings, brooches, necklaces and pendants. I create two collections of limited production and one-of-a-kind jewelry, each based on a different technique. 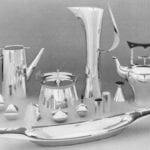 When Joseph Trippetti returned from the Army in 1946, he studied for three years at Philadelphia College of Art and the fourth year at Sheffield College of Arts and Crafts in England, where he majored in silversmithing. 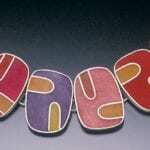 He has been enameling since the 1950s. 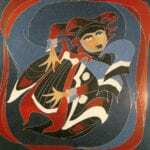 For some years he taught enameling and painting before concentrating on commissions and gallery exhibitions. The medieval tapestries still influence his designs. His cloisonnes were on domed copper plaques before he turned to large steel tiles. 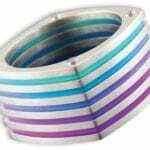 Adding vibrant colors to jewelry can involve any number of methods — from careful enameling by hand to the high-tech physical vapor deposition (PVD) process. 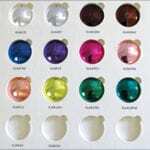 But what if you could use a simple method similar to rhodium plating in your shop to apply a vibrant, durable color in 17 different hues to your precious or base metal jewelry line? That’s the promise of Kliar, a new nanoceramic e-coating developed by Legor’s Plating Division in Bressanvido, Italy. Filmed at Kraftwerks from PM West, Robert Lumabao demonstrates how one refiner makes beautiful and reliable platinum casting grain. By utilizing hydrogen, a spectacular light show of molten platinum is carefully blended with pure ruthenium. Platinum jewelry manufacturing presents some very different concerns when discussing the collection of materials for refining purposes. 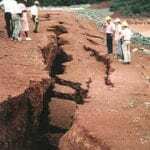 The assumption that methods used for gold and silver collection and recovery can be used for platinum can lead to real problems and problems of perception. Metal corrugation is a unique roll-formed process whereby a precise and specific repetitive surface pattern is achieved when processing thin gauge annealed 36 -24 sheet metal or wire. 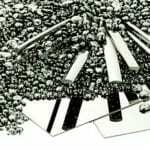 Metal is processed using special tools manufactured with corresponding matching and enmeshing fluted gears that are aligned in such a manner so that the crest of one roller fills the trough of the other. Metal corrugation is a unique process NOT to be confused with the fold-forming techniques studied and highly developed by Charles Lewton-Brain..
Rolling can be thought of as a local, or isolated, deformation process during which thickness is decreased, length increased, and width remains unchanged. Drawing is different from rolling in that the pressure of drawing it not transmitted through the turning action of the mill, but instead depends on force directed locally at the area of compression. 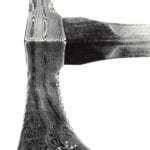 This means the amount of possible drawing force is limited by the tensile strength of the material, a fact that is particularly evident when drawing thin wires..
Metalsmiths and enamelists have used ferric chloride for several years as a safer alternative to nitric acid for copper and brass etching purposes. Although it is generally thought of as etching with an acid, ferric chloride is actually a salt. Etching and resist removal solutions recently developed by Friedhard Kiekeben have greatly improved the process and final product, as well as safety, cost and simplicity. 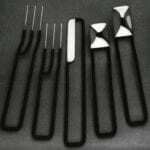 This article summarizes my experiences with these exciting methods for etching metal and removing resists. 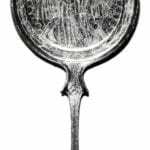 I have also included my own observations as well as an overview of the etching process, resists, equipment and materials necessary. 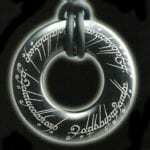 The most commonly used metals for enameling are pure copper and fine silver. 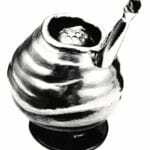 The fine silver is primarily used for jewelry because of its cost, color and the advantage of not producing a firescale coat like copper does when it is fired. 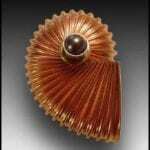 The copper is the most used metal for enameling for many reasons. The purpose of this article is two fold. 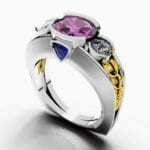 First, we receive a number of inquiries as to whether or not certain metals can be enameled. This article will answer most of those questions. Second, we have all read statements such as, ‘Gilding metal can be fired no more than two times,’ or ‘Platinum can not be enameled because it has a terrific expansion.’ Such statements were based on observations of a limited range of materials. We will show why the statements are misleading. Very little research has been done on the medical problems of artists as a direct result of occupational health hazards. Most research has been done for industrial-type situations. In many cases, industrial workers have greater volume of exposure but, in industry, there are better facilities to deal with these problems. Thus, most metalsmiths are frequently working under much more hazardous conditions than commonly found in industry. 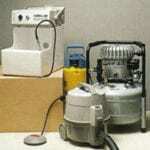 Their lack of concern is frequently due to lack of knowledge about health hazards and Safety precautions. 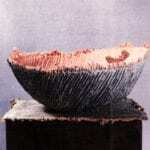 Multi-metal Lamination is a type of ‘faux’ married metal which produces a freer, more ‘painterly’ effect than the hard-edge, highly graphic, married metal. 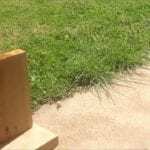 It is a technique in which designs may appear to float over other shapes and patterns. MML may be used in a figurative way or to produce over-all pattern. 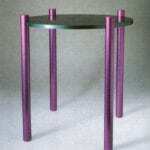 MML is achieved by layering patterns of different coloured metals on top of a thick base plate. 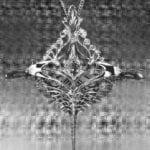 The patterns are soldered onto the surface, and then compressed by passing through a rolling mill. The resulting illusion is of a single piece of metal with patterns of different coloured metals ‘inlaid’ into the surface..
Niello is a deep black metal mixture that is fused onto metal for decorative effect. Though worked on three-dimensional objects, the effect might be considered graphic because it relies primarily on shape and pattern. The contrast of the lustrous black inlay against either matte or polished metal is striking and has earned niello a special place in the arsenal of decorative techniques. 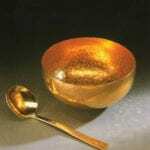 Standard yellow gold alloys which are based on gold-silver copper can be used for many production processes. They could be called all-purpose alloys. However, optimising the alloys for the particular manufacturing process to be employed is possible by use of other alloying additions which can influence relevant properties such as castability and grain size as well as the mechanical ones, for example, strength, hardness and ductility. Only a few elements (e.g. zinc, silicon, iridium, cobalt) have proved to be useful additions for modifying carat gold alloys without detrimentally changing other relevant properties. How to use a TIG torch to melt scrap 950 TruPd for an ingot. 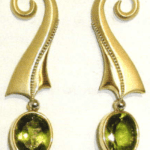 Follow Ganoksin Guide to Industry Web Sites Mfr.#8 Lindsey Jewelers. Its no secret that palladium has captured the attention of the industry. 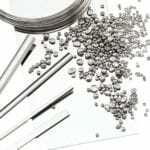 In 2005, purchase of palladium for jewelry use worldwide shot up by 54 percent, according to Johnson Mattheys Platinum 2006, and this past year has seen a proliferation of articles and seminars about the platinum group metal — specifically 950 palladium — as well as the formation of a new industry group, Palladium Alliance International. Yet with all of that interest has also come questions — about how best to work with the metal, how to market and sell it, and what to expect in the future: Is palladium really here to stay? To offer insights into those issues, MJSA invited several industry experts to share their thoughts on what manufacturers can expect when working with palladium. 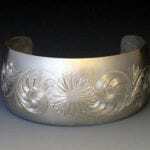 Pat Pruitt of Paguate, New Mexico, has been working with stainless steel for over a decade. Three years ago, he decided to seriously commit himself to making fine jewelry from it, saying, Let me see what I can do with this, how far I can take it. I am all about manipulating metal; there is just something beautiful about sheer metal..
Photoetching metal is simple AND FUN! 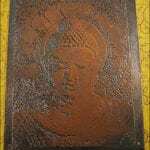 Etching can be used for printing processes, as an artifact of art, or for roller print embellishment. 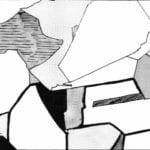 It involves a mordant (acid) to etch an image onto metal and a resist to repel the mordant. A resist can take many forms: plastic, vinyl, marking pens, duct tape, nail polish, etc. As long as it resists the mordant, the procedure will work. This technique creates high resolution images, and intricate surrounding textures that give your pieces an organic quality. With current photocopier, digital imaging and laser printer technologies you have more design flexibility. You can add text, reverse images, and control contrast. The photoetching process we describe below essentially uses the same techniques that printmakers employ. 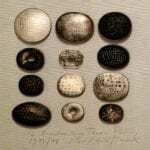 Except we use brass, copper, bronze and silver instead of zinc as printmakers do. 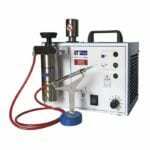 This process also gives you the options of soldering and making cold connections. Throughout the history of jewelry making, metalsmiths have strived to perfect not only their artistry, but their materials as well. In this ongoing quest, innovative metallurgists have produced new white metals in an attempt to combine all the virtues of existing metals while eliminating all the disadvantages. Their goal was to create a metal that resisted tarnish and firescale, that was both malleable and durable, that had a pure white color, and that didnt cost a fortune. Today, platinum is enjoying its renaissance. In the U.S., platinum consumption has risen by more than 700% since 1990. More jewelers are carrying platinum jewelry, and consumers are becoming more aware of the most noble of all metals. 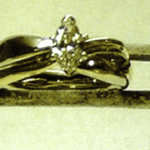 Many jewelers are still confused as to the platinum alloys available, their application and purpose, this paper will attempt to clear up some of these issues. In this presentation I attempted to provide you with information on platinum alloys to help you make an informed decision as to which alloy to employ for your manufacturing venture. There are several alloys I did not mention, mainly because they are experimental and have not found their way into the main stream. An alloy is chosen for its capability, ease of recycling and many other criteria. 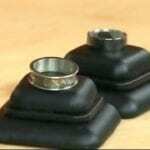 It must be user friendly, scratch and bend resistant and hold your stones securely. 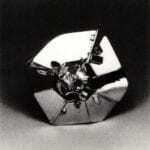 It is further of importance that it can be finished with few or no problems and hold a shine. These alloys that can do all this are here. They are on the market and can do just what you are looking for. It is sometimes just a matter of breaking old habits to see a major improvement in your product. 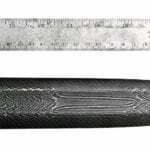 There is a major difference between durability and scratch resistance. Platinum is very durable. When scratched, the scratch actually displaces the metal, leaving ridges on the edges of the scratch. This is where durability comes in. Whereas other precious metals, if scratched, lose metal, and thus wear down, Platinum does so at a much slower rate. 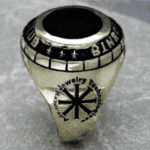 Joining is a very important production technique in the field of jewelry production. 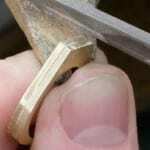 Therefore it is useful to know, what kinds of different joining techniques are possible. 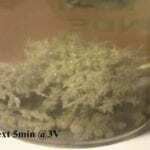 This paper will give you a rough overlook on joining techniques as well as some tips and tricks to do a good joint between platinum and platinum, and between platinum and gold. 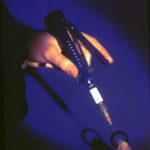 Which technique to prefer depends on the worker skill and on the available equipment. 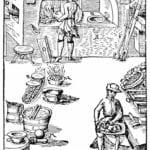 The principle of this ancient, valued procedure is described here because of its historical interest, and with the thought that young people coming into the field should be aware of the basic procedures of the trade, even though they may not pursue them. 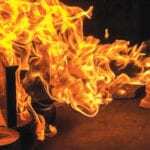 In the case of precious metal refining, it is generally more efficient to send scrap to a reputable refiner where sophisticated equipment and years of experience will insure accuracy. In addition, the procedures described below use dangerous acids that mandate industrial quality ventilation and safety precautions, which makes the decision to send out refining chores even more compelling. 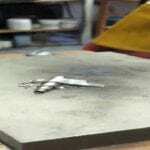 It is also vital to know the basic forms of semi-fabricated Platinum product that are generally available and how to best use them in completing a jewelry project. 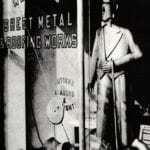 This article addresses three forms of semi-fabricated platinum product: sheet, wire and tubing, along with the procedures generally followed to produce these forms and the importance of knowing both the form and the particular characteristics of the form needed to complete a jewelry project. Applying liquid gold, palladium and/or silver in the final firing of enamel pieces is something that can frequently raise the appearance of a completed piece up to the spectacular. More enamelers should use them, but they should also learn to use them correctly. If they adhere to the following simple suggestions and procedures we feel that greater success will be achieved in their use..
With over 300 tonnes of gold used in electronics each year, end-of-life electronic equipment offers an important recycling potential for the secondary supply of gold. With gold concentrations reaching 300-350 g/t for mobile phone handsets and 200-250 g/t for computer circuit boards, this “urbanmine” is significantly richer than what is vailable in primary ores. When questions arise about manufacturing quality gold jewelry, manufacturers are eager to talk shop with their peers and industry experts. They want to know if they are using the right alloy for a specific application, casting at the appropriate times and temperatures, and annealing properly when work hardening a piece. Rarely, though, does the conversation turn to refining-an area of jewelry manufacturing that poses more questions than answers in many manufacturers’ minds. Refining is a practice that must be done precisely and methodically to ensure the full recovery of gold, as well as an end product that is free of impurities, which can lead to quality problems when the metal is reused in production. 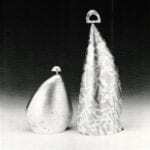 The motivation for undertaking this research was to establish a more expedient process to achieve volumetric forms in non ferreous metals. With the availability of commercial seamless tubings it seemed logical to develop working techniques adapted to this resource. 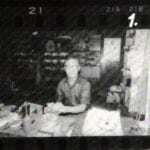 I became involved in blacksmithing in 1971 and while developing the working technology of this area I began to realize that many of the processes of blacksmithing and silversmithing could be incorporated to work copper and copper alloys while in a heated state. 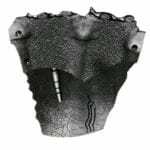 This paper will deal with the application of shaping non ferreous metals by forging and upsetting, by forming through sinking, capping, stretching, raising and pressing, and by bending, misting, cutting, punching, drifting, stamping, chasing, chiseling and rasping while at a red heat. Fabrication techniques of heated metal will also be discussed. 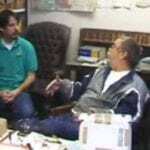 There are no new discoveries in the process, but the research lies in the investigation. The numerous visual possibilities which occur are not possible to achieve without these applications..
A micro-scale experiment explaining some principles related to the refining process of silver. 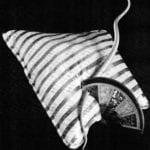 Soumak is a textile technique which is commonly found in the weaving of rugs in the Middle East. 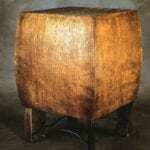 The technique has been around for a couple of thousand years and primarily has been used in cloth. 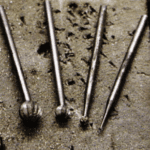 As I learned various techniques of weaving in gold and silver, I adopted soumak as my most successful method for creating or enhancing my designs. Some of my creations are totally woven wire, with very little stone work, and others are integrating the weaving with the placement and setting of gemstones. Artist’s with shared sensibilities and needs often come together to form co-operative studios in order to reduce overhead, share equipment, and develop a greater sense of community. 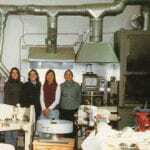 In 1989, with these goals in mind, Paulette Werger, Lynn Whitford, and Agnes Chwae, three friends who had been in graduate school together at the University of Wisconsin-Madison metals program, formed Metalpeople in Madison. Jeweler Jim Charneski, whose background and training was in the jewelry trade, soon joined the group. Following the release of its Sterling with Platinum alloy, ABI Precious Metals in Carson, California, has developed yellow gold alloys that contain platinum. Having had success casting the Sterling with Platinum, we were curious to see how the new yellow gold alloys measured up. ABI sent us three samples of Platinum-enhanced Gold casting grain: 14k, 18k, and 22k. We tested the metal to see how it would perform under real shop conditions, and if the addition of platinum in the alloy made the metal different to work with than typical yellow gold alloys. When it comes to white gold, my customers want the brightest, whitest white they can get — and some are not willing to pay the premium prices palladium can command. 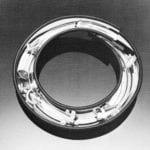 So where do manufacturers turn for a bright white alloy that doesn ot require rhodium plating? Stuller Inc. in Lafayette, Louisiana , may be the place. When I first saw the new X1 nickel-white gold alloy, which falls into the Grade 1 category of the White Gold Whiteness Index, I was impressed by its color. But the true question was how it would perform in my casting shop. The act of contraction into repetitive wrinkles or alternate ridges and grooves. When studying nature forms, corrugation is regularly seen adding innate strength to what might be otherwise considered a frail form. 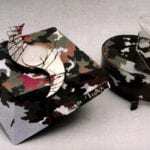 Corrugation has been adopted by industry and used in utilitarian fashion for the manufacture of common objects we regularly see such as packaging materials as well as industrial applications such as roofing, siding, and drainage pipes. 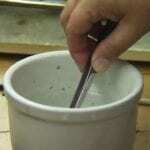 In this article, I will discuss the basics of metal preparation for the enameling process. Some experienced enamelists may disagree with part of this. But remember, these are general rules from a metallurgist’s point of view, not an enamelist’s. 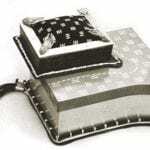 The article is not intended to outline or recommend any particular preparation or enameling technique, but rather explain why we do certain things to precious metals during the process of enameling..
Understanding why solders melt and how they flow is fundamental to mastering soldering techniques. 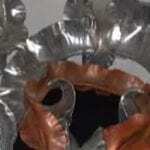 The alloys we use every day to solder our work undergo some amazing transformations as we heat them. If you can stay with me through this article you will understand exactly what you are seeing happening before your eyes as you put a torch to your work. As you will learn, we have our noses pretty close to some pretty incredible phenomena. The first reference that I have that links copperas with the collection of fossils is found in the ‘Life and letters of Edward Lhwyd (second Keeper of the MUSEUM ASHMOLEANUM) Oxford March 28th. 1695’. Below is an excerpt from ‘A Museum of the Early seventeenth Century’ By Cyril Edward Nowill Bromhead, BA, FGS, FRGS. (Read 18Th. June, 1947) referring to the Lhwyd letter. Because titanium behaves somewhat differently than the standard metals in the goldsmith’s workshop some special attention to its working is in order here. 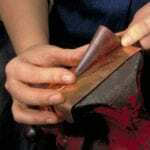 When sawing, begin the cut with a very light stroke, and increase the pressure only when the blade has securely caught. 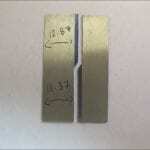 The sawblade can be protected with a lubricating grease, but even with this precaution it will dull quickly. 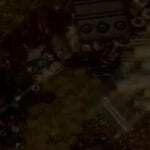 Titanium can be worked with standard files, but. 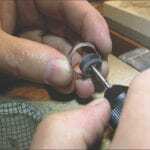 Many tools sold in model/hobby stores can be used for jewelry making. During a recent visit to a hobby shop, I found these tube bending coils, which model makers use to build models that require bent tubing. 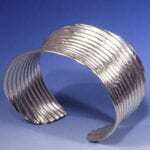 Jewelry makers will find these coils handy when bending tubing for projects. Casting shibuichi in the traditional japanese way on canvas in water. In practice an experienced eye will usually be able to determine by color and luster whether a piece is made of silver, a base white metal such as nickel silver, or a precious white alloy such as white gold or platinum. 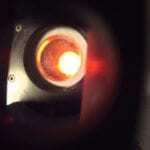 If this can be determined by eye, it’s usual to proceed directly to the qualitative test. With the high price of gold, jewelry makers are looking to incorporate alternative metals into their lines. I frequently work with palladium and stainless steel in my shop. 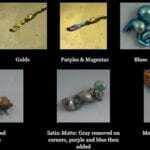 The following are a few tips and tricks you can use to work more effectively with these metals. Soldering Secrets Whenever I solder palladium and have to forge it afterward, I steer clear of palladium or platinum solders, opting instead for 20 karat white gold hard solder. 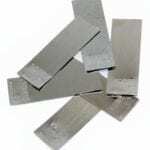 This enables me to have seams that can withstand the various types of forging I do to combine palladium with other alternative metals, such as stainless steel. If the solder seams are precise and meet well, it is difficult to detect any color difference. 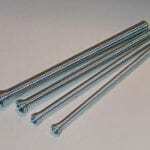 Niobium has many properties that make it an excellent candidate for fabricated parts. 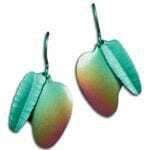 Of particular interest to jewelry manufacturers and designers are niobium’s hypoallergenic nature, formability, and the broad range of anodized colors that can be rendered on its surface. It is considered hypoallergenic and safe to wear for even those most sensitive to metal allergies..
White gold jewelry is a hot fashion trend that does not show signs of cooling off any time soon. Manufacturers are producing it, retailers are buying it, and consumers are demanding it, but none have a clear definition of what alloys can truly be called “white” — until now. A White Gold Task Force led by MJSA and the World Gold Council, comprising members of the supply, manufacturing, and retail components of the jewelry industry, has established a definition of white gold. 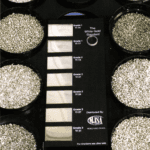 After measuring more than 70 samples of 10k, 14k, and 18k white gold jewelry using the CIELab and ASTM Yellowness Index, the Task Force defined “white gold” as a karat gold with a Yellowness Index value of 32 or less. 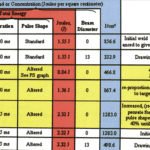 It also proposed a three-tiered grading system in which to categorize white gold as Grade 1, Grade 2, and Grade 3.